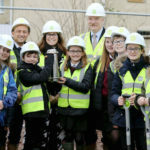 Pupils from Somervale School in Midsomer Norton have buried a time capsule on the site of a new development being delivered by Curo and contractor E G Carter. The time capsule was buried as part of a groundbreaking ceremony to mark the start of construction works at St Chads Green in Midsomer Norton, where 16 new affordable homes will be built by the end of the year. Children were invited to provide items for the time capsule, which will remain underground for at least 30 years. Among the things they buried were a signed uniform tie in their school colours, pictures, letters describing life in 2019, their predictions for the future and a copy of Midsomer Norton Life magazine. The new homes represent an investment by Curo of almost £2m and are being delivered in partnership with Homes England, who provided funding of £480,000 and Bath & North East Somerset, who have awarded a further £200,000 grant. The development includes a mix of 15 houses with two-, three- and four-bedrooms and a one-bedroom apartment. Four of the new homes will be available to buy via Shared Ownership, while the other 12 will be let at affordable rents to local people currently on the local authority’s housing waiting list. Curo Chief Executive, Victor da Cunha, said: “We’re very excited to start building works with contractor EG Carter today at our new affordable development, where more local families will soon benefit from a secure, long-term home. “Regeneration projects like this give us the opportunity to create high-quality affordable homes in key areas of towns and cities and we look forward to welcoming the new residents at St Chads Green later this year. The 16 new family homes are replacing a former sheltered accommodation scheme of 23 flats, increasing the number of people to be housed at St Chads Green by 33 and responding to the greatest pressures on the housing list — which show that the highest demand for affordable housing in the local area is for family homes. Bath & North East Somerset Council Cabinet Member for Economic and Community Regeneration, Councillor Paul Myers commented: “As mayor of Midsomer Norton I am especially pleased to see this development break ground. Midsomer Norton is a great place to live and it’s fantastic that Curo, with support from the local authority and central government, are delivering a 100% affordable housing scheme here. Joanna Postlethwaite, Headteacher of Somervale School, added: “The children were delighted to get involved in the event today and worked hard to put together a selection of items for the time capsule that will provide an historic snapshot of our school and town. Pictured above from left to right are: Curo Chief Executive, Victor da Cunha, Somervale School pupils & Headteacher Joanna Postlethwaite, B&NES Cabinet Member for Economic and Community Regeneration, Councillor Paul Myers and Curo Managing Director Gerraint Oakley. Photograph © Anna Barclay Photography.